Too often Indigenous women and non-binary peoples are not heard or seen as we define and experience ourselves. I am working to redress this by creating images of contemporary indigenous people from an indigenous perspective. An Exploration of Resilience is about identity, culture, strength, vulnerability, and love – these images are about resilience. We are often looked at as inferior or deficient in general society. So much violence and abuse is committed against us. Many of our parents were stolen at a young age, ripped away from their land and placed in the horrendous institution of residential schools. This has created a huge gap in passing down our culture. Many of our relatives were and continue to be inappropriately photographed and misrepresented. My hope is to change the narrow perspective from which violence often stems, and to show the general public who we are today. To bring light to our stories and to provide a space where people can connect with one another. I want to create space for us to be seen and heard as we define ourselves, and how we want to be represented. This is a driving force behind my series. When I show Exploration of Resilience in galleries, I display large portraits with voice recordings from the people that I photograph. The viewer is urged to engage with us as Indigenous women and non-binary peoples as we want to be seen and heard – to look right at us and to listen to the stories we want to tell. In the portraits and with the adjoining voice recordings, I want to tear down stereotypes and have the general public become more empathic. I want to show us as we are right now, but also how different we are and how our experiences differ too. Feeling like you don’t belong can be common, especially for people of mixed ancestry and who are non-binary. I want to create space where people can see that we are all different and celebrate that difference in a way that we may be unable to do in our everyday lives. 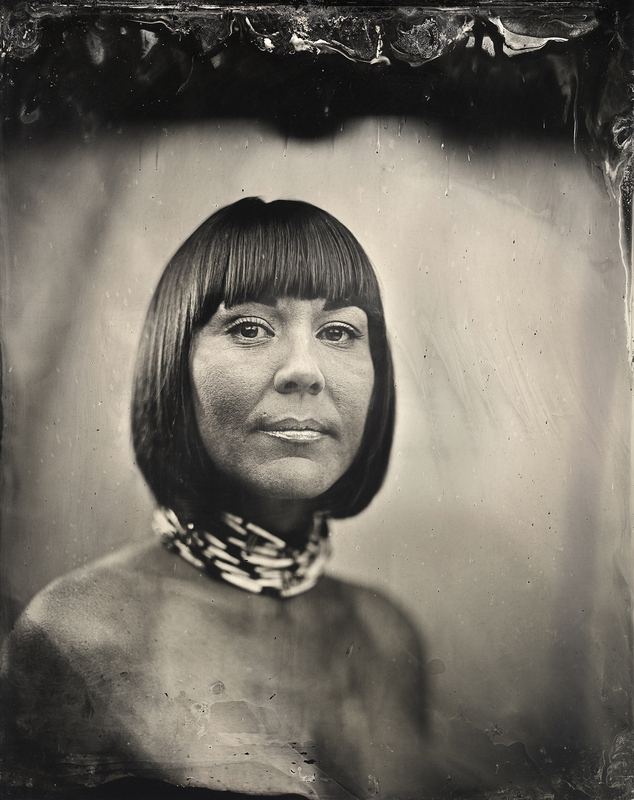 Through the timeless lens of the tintype, and in collaboration with my subjects, the relationship between the process of creation and the person being photographed comes to life. This work investigates different facets of people and how they explore themselves. In this series, I am photographing my community of mostly indigenous and mixed heritage people, while challenging pre-conceived notions of race, gender, and sexuality to touch on how we can become more empathic, empowered people despite the hardships that we have endured. Every photograph, every person, has a story to tell, and I am telling it through their portrait. I hope the viewer can recognize the different sides of these stories, including the pain, but most of all, the subject’s spirit and perseverance. When I photograph a person, I aim to create the most honest image of them. I believe that each image I take is a collaboration between the person I am photographing and myself. I wouldn’t be able to create the images I do without trust, which makes that an essential element of my work. There is urgency to my work. I am part of a generation that is hugely affected by residential schools and settler colonialism. We are in a race against time as we are losing many of our elders, along with our stories, language, and culture. It is a struggle for our generation and for those to come. We need to spend time listening to our elders and learning from them. I often feel torn between worlds – between my culture, people, and land, and the world that I am trying to break into as an artist. Many of my peers struggle with this as well – with holding onto our identities and re-discovering ourselves in this era of settler colonialism. These are topics I bring forth in my work. I am imaging a resilient community that is fighting to rediscover itself within difficult contexts. This community includes people who grew up immersed in their culture, knowing exactly who they are and where they come from; it also includes people who grew up away from their land and for many different reasons, including the effects of colonization, residential schools, and lateral violence. Kali Spitzer is Kaska Dena from Daylu (Lower Post, British Columbia) on her father's side and Jewish from Transylvania, Romania on her mother's side. She is from the Yukon and grew up on the West coast of British Columbia in Canada. At the age of 20, Kali moved back north to spend time with her Elders, and to learn how to hunt, fish, trap, tan moose and caribou hides, and bead. 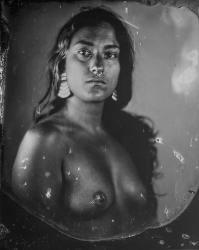 Kali documents these practices with a sense of urgency, highlighting their vital cultural significance. She focuses upon cultural revitalization through her art whether in the medium of photography, ceramics, tanning hides, or hunting. She views all of these practices as art and as part of an exploration of self.